When Thunder attack in Iraq commenced by the British Army, soldiers pushed forward with the L86 A2, earning its invaluable reputation. The L85 series has a unique bull pup design where the bolt group and magazine are placed in the stock behind the trigger. The design allows the weapon to be shorter and lighter, while keeping the same barrel length and effective range at the same time. The benefit is improved maneuverability in narrow space with the same power and accuracy needed for open field battles. ICS, a world leader in AEG manufacturing, proudly release the L86A2 LSW following the successful release of the L85A2 assault rifle. 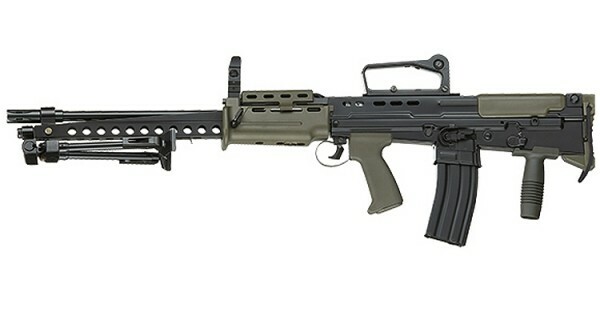 The L86A2 is designed by ICS dedicated engineering staff who designed and perfected the L85A2. Thus making it the most affordable and outstanding L86A2 LSW available. When you hold this new AEG in your hands, your heart will pump with adrenaline as you envision yourself in glorious battle. The bipod can carry the heavy weight of L86 A2 without question. Besides, the bipod can automatically be retracted by pushing the button. It is an excellent bi-pod with perfect looks and functionality. The action of trigger is same as the real L85/L86 A2. When the trigger reaches the position, the electric brake module responses, connects, and electrify. The electric brake is patented design which won’t burn away.